Plant available for hire includes 360º Excavators ranging from 13 tonne to 23 tonne in size, Crawler Excavator/Dozer, 180º Backhoe Excavators together with Mobile Crushing and Screening equipment. All come with experienced and skilled operators. Plant is available on a day work and general hire basis. 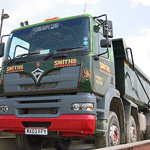 The Group's extensive tipper fleet is also available for hire either on daywork or on a per load haulage basis, either in conjunction with, or independently of, our own plant. Our Tippers come in a range of sizes, allowing us to carry up to 30 tonnes on aggregates, or up to 20 tonnes for cart away purposes. On many construction projects, earthworks are often let as a package, so don't hesitate to contact us for our combined haulage and plant hire services.